Richard M. Alderman. Texas consumer law : cases and materials. 14th ed. Grail & Tucker, c2011. 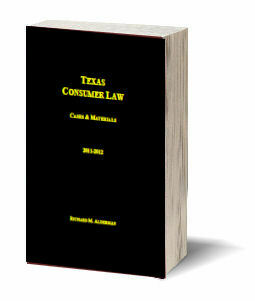 This casebook, written by Associate Dean Richard Alderman, is designed to provide an understanding of Texas consumer law, with an emphasis on the Texas Deceptive Trade Practices Act (DPTA). It presents the material in a combination of traditional case analysis and problem solving. Because most Texas consumer law is statutory in nature, the book also includes a substantial statutory appendix containing the text of the DPTA and relevant state and federal statutes. 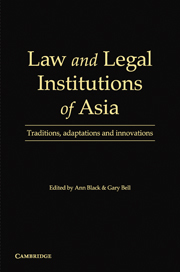 Law and legal institutions of Asia : traditions, adaptations and innovations / edited by E. Ann Black, Gary F. Bell. Cambridge University Press, 2011. The study of Asia and its plural legal systems is of increasing significance, both within and outside Asia. This book offers a comprehensive assessment of 11 key jurisdictions in Asia. For each, it covers the historical factors that shaped the country's legal system and traditions, the sources and nature of the laws today, the key legal institutions, including what bodies have law-making and adjudicative authority, the legal culture, the legal profession, and new directions for the nation's laws and legal institutions. The international handbook on private enforcement of competition law / edited by Albert A. Foer, Jonathan W. Cuneo, Randy Stutz, Bojana Vrcek. Edward Elgar, c2010. Melvin I. Urofsky, Paul Finkelman. A march of liberty : a constitutional history of the United States. 3rd ed. Oxford University Press, c2011. Stephen Fishman. The copyright handbook : what every writer needs to know. 11th ed. Nolo, 2011. Principles of constitutional environmental law / edited by James R. May. American Bar Association, Section of Environment, Energy, and Resources, c2011. Michael H. Graham. Federal Rules of Evidence in a nutshell. 7th ed. Thomson/West, c2011. Guide to EU pharmaceutical regulatory law / edited by Sally Shorthose. Aspen Publishers, 2011. Forms & fundamentals / edited by Emmie R. Smith. 2011 ed. American Immigration Lawyers Association, c2011. Ulrich Beyerlin, Thilo Marauhn. International environmental law. Hart, 2010. Edward Grosek. The secret treaties of history. 2nd ed. William S. Hein & Co., 2007. Marcia Stewart, Ralph Warner, Janet Portman. Leases & rental agreements. 9th ed. Nolo, 2011. Francesco Berlingieri. Berlingieri on arrest of ships : a commentary on the 1952 and 1999 arrest conventions. 5th ed. Informa, 2011. John Schofield. Laytime and demurrage. 6th ed. Informa : 2011. The law and theory of trade secrecy : a handbook of contemporary research / edited by R.C. Dreyfuss, K.J. Strandburg. Edward Elgar, 2011. A review of the Federal Aviation Administration's research and development program : hearing before the Subcommittee on Space and Aeronautics, Committee on Science, Space, and Technology, House of Representatives, One Hundred Twelfth Congress, first session, February 16, 2011. Energy efficiency standards : hearing before the Committee on Energy and Natural Resources, United States Senate, One Hundred Twelfth Congress, first session, to receive testimony on S. 398, a bill to amend the Energy Policy and Conservation Act to improve energy efficiency of certain appliances and equipment, and for other purposes, and S. 395, the Better Use of Light Bulbs Act, March 10, 2011. Exports' place on the path of economic recovery : hearing before the Subcommittee on International Trade, Customs, and Global Competitiveness of the Committee on Finance, United States Senate, One Hundred Eleventh Congress, first session, December 9, 2009. Expressing condolences to the people of New Zealand for the terrible loss of life and property suffered as a result of the deadly earthquake that struck on February 22, 2011 and expressing heartfelt condolences and support for assistance to the people of Japan and all those affected in the aftermath of the deadly earthquake and tsunamis of March 11, 2011 : markup before the Subcommittee on Asia and the Pacific of the Committee on Foreign Affairs, House of Representatives, One Hundred Twelfth Congress, first session on H. Res. 139 and H. Res. 172, March 31, 2011. Learning from the states : individual state experiences with the healthcare reform coverage initiatives in the context of national reform (roundtable discussion) : hearing of the Committee on Health, Education, Labor, and Pensions, United States Senate, One Hundred Eleventh Congress, first session, on examining individual state experiences with the health care reform coverage initiatives in the context of national reform, April 28, 2009. Mental health and substance abuse parity : hearing before the Subcommittee on Health of the Committee on Ways and Means, U.S. House of Representatives, One Hundred Tenth Congress, first session, March 27, 2007. Moving forward after the National Transportation Safety Board report : making Metro a safety leader : hearing before the Subcommittee on Federal Workforce, Postal Service, and the District of Columbia of the Committee on Oversight and Government Reform, House of Representatives, One Hundred Eleventh Congress, second session, September 23, 2010. National security, interagency collaboration, and lessons from SOUTHCOM and AFRICOM : hearing before the Subcommittee on National Security and Foreign Affairs of the Committee on Oversight and Government Reform, House of Representatives, One Hundred Eleventh Congress, second session, July 28, 2010. Nomination : hearing before the Committee on Foreign Relations, United States Senate, One Hundred Eleventh Congress, first session, April 28, 2009. Reviewing the national broadband plan : hearing before the Committee on Commerce, Science, and Transportation, United States Senate, One Hundred Eleventh Congress, second session, April 14, 2010. The Coast Guard's fiscal year 2007 budget request : hearing before the Subcommittee on Fisheries and the Coast Guard of the Committee on Commerce, Science, and Transportation, United States Senate, One Hundred Ninth Congress, second session, June 15, 2006.